EM Solutions is respected globally for its premium maritime and land on-the-move satcom terminals, acknowledged as a technology leader in high speed communications from moving platforms. The emergence of digital technology in the 1970s and 1980s was a seminal change for the telecommunications industry, since that technology allowed for massive improvement in spectral efficiency and witnessed the emergence of techniques, such as forward error correction (FEC), digital filtering and equalization that improved communications quality over poor lines. The dominance of IP and then the emergence of the internet in the late 1990s was equally important, since packet switching has simplified multiplexing, improved accessibility, and expanded network architectures, while the connectivity of the Internet has provided the broadband applications that have massively driven the growth of global telecommunications carriers. Then came the social media revolution in the 2010s; are we really better for that? However, the physics of satellite communications (SATCOM) has always kept it apart. Long hops and limited power budgets place much lower bounds on signal to noise ratio and satellite practitioners look enviously at recent advances in terrestrial cellular networks, where MIMO antenna systems, high order modulation schemes, and low-cost terminals are meeting the ever growing demands for high speed data — where service is available. However, satellite still remains the only communications technology that is available any place, any time. Recognizing early on that Ka-band solutions would be required to meet the growing data needs of the defence community, EM Solutions started to migrate many of its products to Ka-band in the mid-2000s and build them into more advanced systems. Since 1998, the company had been developing bespoke and customized solutions for customers, which initially were the Australian Defence Force and local telcos. From its roots as a developer of solid-state power amplifiers, filters, and oscillators it progressed up the value chain to develop high speed receivers and transmitters for radios, and now on-the-move terminals, to become the partner of choice for several European systems integrators and increasingly, defence forces around the world. For example, the company’s 80W Ka-band linearized BUC still remains the only airborne qualified solid-state BUC at this power rating on the market, and was first developed specifically for a customer in Europe. EM Solutions has a long heritage of providing communications solutions to the military. In 2008, the company won an initial sponsorship from the Australian Army to develop a land-mobile Ka-band terminal. EM Solutions were fortunate to be able to test multiple prototypes over the Optus C1 satellite and to perfect the company’s “monopulse” pointing technology before progressing to WGS certification. The development of this unique pointing technology has taken the company on other fruitful journeys; for instance, EM Solutions designed and manufacture the E-band (80 GHz) radios operating at 10 Gbps that now link the New York financial markets, but also have application for high data rate ship-to-ship communications, offering ten times the speed of existing products. How can a small Australian company be unique and relevant? By providing multi-band solutions, by being willing to customize SATCOM systems, and by developing superior technology, such as terminal stabilization. 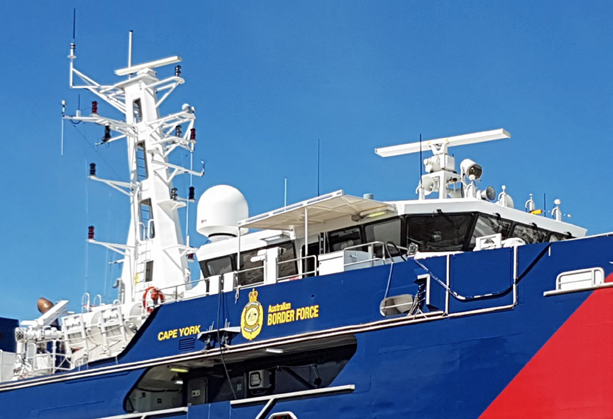 In 2017, EM Solutions completed the installation of the firm’s dual Ka-band Cobra terminals onto the Australian Border Force Cape Class fleet. The company’s partnerships with Inmarsat and Intellian proved productive, enabling it to certify the terminals on the Inmarsat GX network as a fall back to operation on the WGS system. Meanwhile, the company’s land-mobile terminal, the Taipan, has continued to roll out for a major European army (in X-band) as it will shortly for an army in Asia (in Ku-band). By aspiring to the level of “assured” communications, EM Solutions continues to cement its position as a company known for products unmatched in reliability and robustness. The company’s research with the University of Queensland also continued, testing innovative research on a novel reconfigurable Flat Panel Antenna — that aligns with the company’s terminal strategy to offer both broadband and monopulse steered on-the-move operation. EM Solutions hope to report on success with its prototype early next year. EM Solutions made a number of changes on the inside to accommodate the advancements happening externally. The company grew its talent base by 20 percent, adding diversity to its pool of human capital and strengthening its existing innovative capacity. What else did EM Solutions do with its human capital? Well, they say there is nothing more Australian than spending time in somebody else’s country — so this year, EM Solutions did that, as well. EM Solutions sent staff to the U.S., Canada, the UK, UAE, China, Korea and Japan, and secured more than $6 million in orders from four continents. EM Solutions sent its people to source suppliers, support terminal installations, participate in learning opportunities, attend conferences, and to meet the people with an appetite for change — the company’s customers. Those who stayed in Australia ensured that the innovation engine continued to hum. EM Solutions was named a Finalist in the 2017 Premier of Queensland’s Export Awards in the categories of Innovation, Defence, and Manufacturing, as well as in the 2017 Brisbane Lord Mayor’s Business Awards for Doing Business in Asia. EM Solutions especially appreciates these local acknowledgements because such confirms the company is respected at home as well as by customers abroad. Two of the company’s biggest advantages have been flexibility and innovation and these haven’t waned. Innovation occurs by building on the shoulders of giants that have gone before — the real giants in the innovation puzzle are those customers who embrace innovation and are prepared to fund its development. Such customers push the technology envelope and drive innovation by demanding specialized requirements, new features, and performance improvements. As 2017 draws to a close, EM Solutions salutes its customers who are the real heroes. Author Dr. Rowan Gilmore is the Chief Executive Officer of EM Solutions and a Senior Contributor for MilsatMagazine. To learn more about the company and products, please access www.emsolutions.com.au. In the field of government satellite communications, Hisdesat has worked intensively on the definition of a new government satellite communications program — SpainSAT NG — created to offer continuity to the firm’s current generation of satellites, whose useful life extends until 2021. Xtar-Eur and SpainSAT, the company’s two communications satellites, continue to operate in an optimal manner and provide the secure communications services demanded by the firm’s national and international clients, including the U.S. Department of Defense (DoD). The new program includes missions with capacities in the X-, Ka- and UHF-bands and integrates new innovative elements of the last satellite generation, which will allow Hispasat to be at the identical technological and operational levels of other large countries and space operators. Military communications are an essential part of the Command and Control (C&C) capacity of the operations and deployments of the Armed Forces in the various geopolitical scenarios and Hisdesat continues to respond to those crucial demands, promoting new developments with investments in R&D. In addition, the company has played a leading role in both the European Defense Agency (EDA) and the North Atlantic Treaty Organization (NATO), which has enabled the firm to increase their position, recognition and image on an international level. The company is involved in the final phase of the consortium’s feasibility study commissioned by the EDA, which is part of for a future European Government Satellite Program (GOVSATCOM) and is framed by the GOVSATCOM initiative launched by the European Council of 2013. Spain plays an most important role in this development as the nation is also a leader in the program. Hisdesat has also was in charge of the Industrial Advisory Group of NATO (NIAG) study regarding the “Potential use of High Capacity Satellite Systems (HTS) in NATO.” This study was comprised of 21 companies from nine nations. 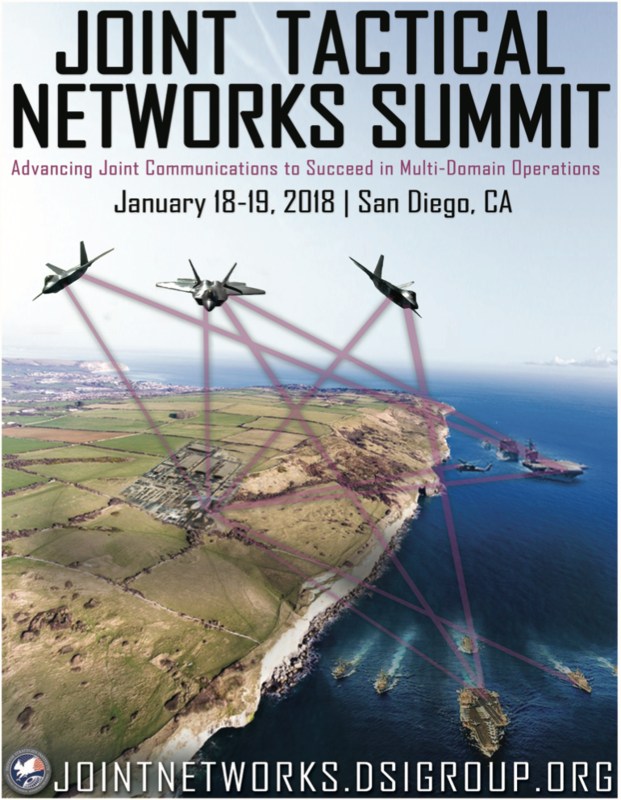 The company has continued with a strategy that was initiated a couple of years ago of active participation in the working groups for this alliance, which will define the future capacities of SATCOM services within the “Future NATO SATCOM” in the 2019 to 2034 timeframe. This strategy is aimed at aligning national interests with the requirements of the communications package that will enable Spain to become a future satellite provider for NATO through the new generation of government MILSATCOM / GOVSATCOM satellites that Spain will launch into operation at the start of the next decade. Hisdesat’s participation in the National Consortium for the development of the Space Surveillance Tracking (SST) reaffirms the firm’s commitment that is focused on providing value to customers and of being a reference in those areas of space that are related to national security and defense. Regarding Earth Observation (EO), the company committed to the Falcon 9 launcher from SpaceX to place the PAZ radar satellite into orbit with the launch scheduled for January 30, 2017, from the Space Launching Complex (SLC) 4E at Vandenberg Air Force Base in California. Hisdesat engineers will operate and manage PAZ and the company’s system upgrades will provide the highest levels of quality of service from the very start of satellite operations. The company continues to count on the collaboration of INTA (owner of the Ground Control Centre of PAZ) to ensure the expected efficiency of the satellite’s services. The PAZ satellite incorporates as the main payload an active sensor with Synthetic Aperture Radar (SAR) technology to provide images of different sizes and resolutions during day and night hours and regardless of the weather conditions. These capabilities will allow Earth Observation (EO) for multiple applications, government and commercial, including requirements for very high-resolution images, below the meter size. Hisdesat’s PAZ satellite. Photo is courtesy of Airbus Defence and Space. The satellite will be able to capture more than 100 high-resolution images and cover an area of more than 300,000 square kilometers per day. PAZ will orbit Earth at 15 revolutions per day at a height of 514 kilometers and with a speed of seven kilometers per second. Given the satellite’s slightly inclined, quasi-polar orbit, PAZ’s Earth coverage will offer an average 24-hour revisit time. As secondary payloads, the PAZ satellite will carry an ICE-CSIC Radio Occultation and Extreme Precipitation experiment (ROHP) as well as an AIS receiver from the Canadian company, exactEarth — Hisdesat is the largest shareholder of that company, and for the first time, a simultaneous merger of SAR and AIS data can be acquired, enabling the best possible monitoring of the maritime environment around the world. 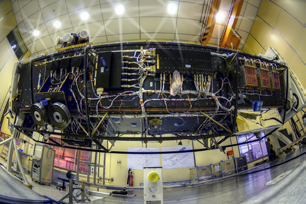 The satellite’s main contractor was Airbus Defence & Space and the build of PAZ involved a consortium of 18 Spanish companies and universities. The PAZ satellite will be located in an identical orbit as the German satellites TSX and TDX to form a SAR constellation. This constellation will be exploited by Hisdesat and Airbus DS GEO to offer a shorter revisit time as well as a greater number of images for clients. In relation to the company’s other businesses, it is worth highlighting the evolution of the firm’s AIS satellite services company in Canada — exactEarth — which together with Harris Corporation, placed into service five satellites of the AIS constellation, which now reaches nine and allows for the tracking of more than 250,000 ships worldwide in real time (S-AIS). exactEarth also launched eight satellites with Iridium NEXT, marking a milestone in the global maritime industry. This system has more than 70 payloads that can provide actionable data in seconds and provides users with significant advances in maritime safety and efficiency. Hisdesat’s future prospects are exciting and the company will continue to work to achieve new goals, all the while offering strategic value to customers as well as meeting the demands of various markets — 2018 will be an evolutionary year for Hisdesat. Author Miguel Ángel Panduro is the Chief Executive Officer of Hisdesat. To learn more about the company and products, please visit www.hisdesat.es. Hughes experienced another great year in 2017 as the company continued to build on the firm’s market leadership in broadband satellite systems and services around the globe and notably establishing the groundwork for long-term opportunities supporting the military and federal, state and local civilian agencies. Following its successful launch from Cape Canaveral in December, 2016, EchoStar XIX — the world’s largest capacity communications satellite — was put into service in March, joining the existing EchoStar XVII and SPACEWAY 3 broadband satellites to provide more than 300 Gbps capacity covering the vast majority of North America and parts of Central and South America. Designed with Hughes JUPITER™ System technology, EchoStar XIX is a multi-spot beam, Ka-band satellite that is the cornerstone of the new HughesNet® Gen5 service, which is capable of delivering 100 Mbps download speeds to individual VSAT terminals. Recognized by the FCC as the only broadband internet service with 25 Mbps downloads available nationwide, HughesNet Gen5 brings high-speed connectivity to any government office or remote site, such as park stations, which aren’t reached by terrestrial providers due to high cost of infrastructure. Only satellite offers affordable and scalable high-speed connectivity virtually anywhere. Agencies can also employ satellite broadband to establish hybrid networks, which use a blend of terrestrial fixed and wireless network technologies to increase network availability and application performance. One major initiative underway today in the U.S. is the adoption of Next Generation 9-1-1 (NG911) systems. Many Public Safety Answering Point (PSAP) locations have reported unpredictable network outages along with this new IP-based technology adoption due to various reasons. These interruptions are caused by severe weather or just technology flaws and human errors leading to failures between the local access facility and the connection to the PSAP regional point-of-presence (PoP). Hughes has designed a seamless network backup solution leveraging satellite technology which does not rely on vulnerable terrestrial infrastructure. By adopting NG911 architectures that include this kind of satellite backup solution, PSAPs will gain the benefit of enhanced network availability in accessing next-generation capabilities like text-to-9-1-1, image/video communications and accurate cellular caller location. 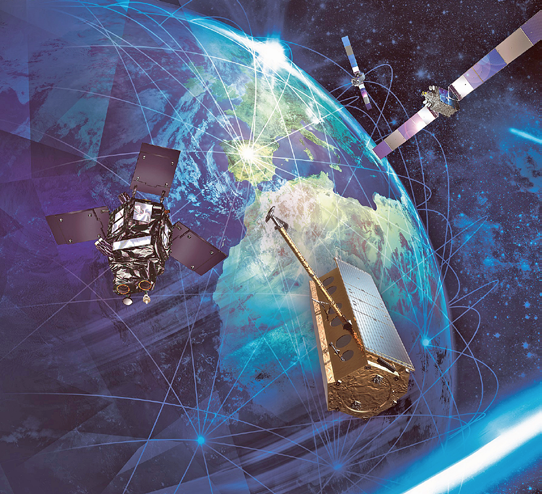 Artistic rendition of the EchoStar XIX Ka-band satellite. Satellite has proven to be invaluable in emergency response efforts following disasters like hurricanes Katrina and Sandy. Most recently, Hurricanes Harvey, Irma and Maria brought a level of destruction that hasn’t been seen for years, wiping out local infrastructure and leaving people, businesses, aid organizations and government agencies without reliable communications. Hughes partners with government agencies and NPO’s to provide communications capabilities for first responders and in Puerto Rico alone, deployed hundreds of terminals in support of relief efforts, working with local hospitals, pharmacies and the airport authority, among other organizations. This year, Hughes announced the company will be offering telecommunications products and services through the General Service Administration’s (GSA), Enterprise Infrastructure Solutions (EIS) contract. Hughes partners as a subcontractor to prime contract awardee Level 3 Communications on this 15-year vehicle for telecommunications requirements. As agencies prepare to transition their contracts from the old Networx contract vehicle, the years ahead will see substantial task order activity, with agencies using EIS to heed the call to modernize their network technology. Under EIS, agencies will be able to supplement their existing networks with next generation satellite broadband to connect “last mile” sites that still struggle to get adequate operational bandwidth. Hughes also brings a terrestrial broadband offering as part of a managed services model to deliver each site the best available service technology, whether it be cable, fiber, DSL, 4G or satellite. Hughes has developed a cutting edge managed SD-WAN solution that adds new levels of network automation to drastically improve cloud-based application performance and overall network availability. Beyond reducing overall cost by leveraging the low cost-per-bit of broadband, a critical byproduct of the Hughes Managed SD-WAN solution is added layers of security features to protect agencies from the rising number of threats from hackers. Hughes was selected for a study program this past summer to support the U.S. Department of Defense (DoD) in planning how to make the most of the latest satellite communications technology, winning two awards under the Wideband Communications Architecture Study (WCAS) contract. Hughes is the prime on one study award and a subcontractor to an award won by the Kratos Communications team and will deliver a wide-ranging commercial perspective on how different satellite systems can interoperate for wideband government applications. Mobility has become the driving factor in military customer’s requests for communications solutions. More powerful in-flight connectivity for fixed-wing aircraft, and Comms-On-The-Move (COTM) capabilities for airborne, maritime and ground operations were just a few of the steps we took this past year to improve capabilities for military users. In March, the Hughes HM200 modem was recognized by industry at the Satellite Show in Washington D.C. as the top aero mobility SATCOM innovation by the Mobility Satellite Users Association (MSUA). It can be paired with any size of qualified antenna to connect a mobile platform to the satellite and then to one or more ground stations, anywhere in the world, supporting a superior level of mobile video, voice and data, even in the harshest environmental conditions. Hughes launched the unique HeloSat Solution that provides reliable in-flight satellite connectivity for a full 360-degree range from the aircraft. Hughes innovation led to the introduction of the HM500 ManPack Terminal—a light, multiband satellite terminal providing on-the-pause communications for forward-deployed teams, whether on the battlefield, on a search-and-rescue mission or conducting aerial disaster assessments. Taking the network out into the field requires advanced waveforms and cyber security measures for operation in contested environments. Today’s increasing threats from more sophisticated adversaries have created significant security challenges for military SATCOM users. To help counter this development, Hughes engineers created specialized satellite waveform algorithms that can address enemy detection and different types of RF jamming tactics. Hughes is also working with state-of-the-art LPI/LPD waveforms that provide additional resiliency against these new and more sophisticated threats. 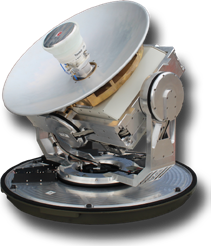 Compatible with commercial Ku- and Ka-band satellites, the solution is now a commercially available anti-jam solution for operation in contested environments. Hughes is looking forward to continuing the firm’s work supporting General Atomics Aeronautical Systems, Inc. (GA-ASI) to provide satellite communications on their “Type-Certifiable” Predator B remotely piloted aircraft (RPA) known as SkyGuardian. The new SkyGuardian aircraft will provide next-generation capabilities, integrating enhanced safety and reliability systems that will enable RPA to fly within civilian airspace, along with an increased payload capacity that will support a wide variety of mission sets. Hughes is upgrading the UAV’s satellite communications system with the HM400 modems which are enhanced versions of the HM200, designed for the specific requirements from General Atomics. In 2018, Hughes will continue moving forward with developing the company’s JUPITER™ 3 ultra-high-density satellite, which, when launched in 2021, will provide a dramatic increase in broadband capacity to meet rising demand across North and South America. With planned offerings at speeds of 100 Mbps, JUPITER 3’s coverage will be optimized to cover key areas of demand for capacity. This kind of satellite innovation together with developments for smaller and lighter terminals as well as the company’s partnership with OneWeb will offer governments and their militaries cutting-edge capabilities that can be deployed rapidly and securely to meet their evolving missions. Why was ND SATCOM so successful in 2017? 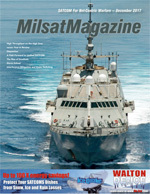 For the military sector, “Making Missions Possible” is the apt slogan for ND SatCom. The company’s reputation for being a reliable long-term partner is underscored by serving as a reliable supplier and logistics partner for military ground units as well as for investing in the extension and expansion of existing ground infrastructure in the field. New projects and upgrades are benefiting from ND SatCom’s work ethic and customer-centricity: the firm’s teams are onsite, they ascertain and understand the end users’ needs and they ensure the products are 100 percent operational — where and whenever needed. SKYWAN networks have been, or are currently, being deployed for: (1) a military project in India, (2) a SKYWAN COTM network for Myanmar and, (3) a network for MoD Oman with fixed, mobile, and maritime solutions based on SKYWAN 5G. ND SatCom won these large-scale projects after several months of testing and evaluation. At AFCEA (April of 2017), ND SatCom presented their joint solution with RUAG Defence: RUAG ARANEA is a platform for tactical communication relying on SKYWAN 5G for voice and data transmission via satellite in the most efficient way for vehicles or portable stations. ND SatCom´s ground segment expertise is well positioned to the communication need of multinational forces, e.g., NATO. Due to upcoming demand for leadership support, ND SatCom was awarded a contract to deliver new systems and upgrade existing solutions for land, air, sea and Special Forces for rapid deployment. In November, the company’s SKYWAN 5G technology passed initial system tests — on time — for a military ground-segment solution. This is the first step towards more comprehensive field trials. The encryption plug-in card (field-upgradeable and announced for 1H2018) will make this product more secure and even more attractive. In 2017, ND SatCom continued building and demonstrating solutions for 3G/4G cells with highly reliable connectivity to an MNO’s core network or private enterprise network. For example, one demonstration at Pacific Endeavor (an event by U.S. Command for disaster relief organizations in the Pacific Region) featured rapid deployable LTE cells. Another was hands-on training exercises where Speedcast and General Dynamics used SKYWAN 5G as the satellite link. SKYWAN 5G was chosen due to its TCO savings and easy integration into flyaway terminals of major U.S. manufacturers. The business unit “Defence” is partner for the German armed forces satellite ground network supporting with Integrated Logistic Support (ILS). 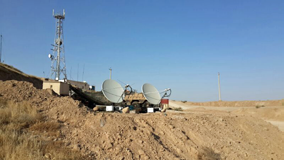 ND SatCom is primarily responsible for full lifetime maintenance of the many mobile ground station elements. “Installing Reliability” is ND SatCom’s mission when it comes to this vertical market. With 99.95 percent TDMA channel link availability and master node redundancy, SKYWAN networks epitomize reliability. ND SatCom is the supplier-of-choice for the Brazilian “System House” Atech, an Embraer subsidiary specializing in critical mission solutions for the defence and public safety, air traffic management and corporate market sectors. In 2017, ND SatCom provided for Atech a SKYWAN network with fixed and portable sites for building an ATC network for civil and governmental purposes. The Thales group selected SKYWAN 5G to modernize Bolivian ATM telecommunications with a nationwide VSAT Network. For Air Traffic and Navigation Services (ATNS) and Agency for the Safety of Air Navigation in Africa and Madagascar (ASECNA), more ATC networks using SKYWAN are in the roll-out phase in Africa. When a broadcasting company in a cost-sensitive region, such as Africa, invests in a Communication-On-The-Move (COTM) solution for media contribution, such is a bold and forward-thinking decision. Multiple new SNG vehicles are in the pipeline to significantly improve the daily workflow of newspeople in this region. ND SatCom has orchestrated the world’s first combination of the firm’s Satellite-On-The-Move (SOTM)-capable VSAT technology — SKYWAN — a cost-efficient SOTM antenna and the satellite capacity-allocation planning tool Media Fleet Manager. This combination is also being rolled out for ND SatCom’s customer SABC, a broadcasting company in South Africa. ND SatCom realized several SNG projects during 2017. The largest ones have been rolled out for Hungarian TV operator HDT and the Finish broadcaster YLE. In mid-2017, the SKYWAN 5G firmware release R1.3 introduced additional QoS mechanisms, node redundancy up to N+M, a doubling of the TDMA channel number for a network bandwidth up to 320Mbps, and an increased DVB-S2 receive data rate for the end-user to more than 80Mbps per remote station. For safety critical networks, this release implemented an open interface to external crypto devices for TDMA-layer payload encryption. After intensive interop tests with 3G and LTE equipment, SKYWAN 5G nodes backhauled cell-to-core and interconnected cells-to-cells out of the box. eNodeB manufacturers experienced new network topology options with SKYWAN 5G — from simple point-to-point backhauling to meshed cell groups where topology limitations are in current eNodeB implementations. Additionally, LTE component manufacturers identified and are planning feature extensions in future firmware to benefit from OpEx savings and higher user experience in enterprise or closed networks with the use of SKYWAN 5G. BU Broadcast developed a new web interface for the company’s antenna control units (ACU 50x0), which provides the possibility to more easily control the antennas through the use of tablets or smartphones. ND SatCom’s formula for success keyed on highly reliable solutions at reasonable price points. The firm’s revenue grew significantly in 2017, due in part to project wins for ATC networks. In Europe, especially in the military sector, the order backlog increased considerably, with major long-term maintenance contracts awarded until 2025. In the North American market, SKYWAN 5G attracted new customers from the commercial and military (DoD) sectors. SSi Micro, a new Canadian customer, selected SKYWAN 5G to build a VSAT network, a decision likely influenced by both service and technology advantages of local on-site training and SKYWAN 5G’s unique cascading capabilities. DoD customers are currently evaluating SKYWAN 5G’s new bandwidth pooling capabilities and encryption features. With its regional affiliates, ND SatCom significantly increased business successes. With a surge of almost 30 percent in revenue vs. 2016, the company’s global sales team outperformed themselves. The business unit “Broadcast” surpassed its target and achieved 120 percent of last year’s result. The driver for this success was the company’s field proven technology, delivery on time and excellent cooperation between customers and engineering and support teams. Based on the SKYWAN portfolio, the business unit “VSAT” won all projects it sought for ATC networks. Author Dr. Michael Weixler is the Head of Product Marketing for ND SatCom. For additional company information, please access the company’s infosite at www.ndsatcom.com.